CityTalk | 5 Days to the World Congress: How do cities learn from science? 5 Days to the World Congress: How do cities learn from science? ICLEI is very much looking forward to welcoming participants to the Researchers’ Symposium at the ICLEI World Congress 2015 in Seoul, 8-12 April. The Researchers’ Symposium will provide a wonderful opportunity to further the debate on the relationship between research and policy in an urban context. This relationship is critical to sustainable development but is challenging to foster and maintain. So how does it work, and how can we make it better? A considerable amount of the recent progress in developing and achieving sustainability goals at the city level can be attributed to the growing consensus that urban sustainability requires the alignment of efforts from the private sector, local governments, and support organizations. Yet despite these efforts, even the leading local governments and the best practice private actors continue to struggle with insufficiencies in capacity, expertise, and resources. The next wave of transitions for cities will be the result of incorporating the comprehensive work being conducted by researchers across academia, NGOs, and government. That being said, although researchers and local governments are often eager to collaborate, several barriers are frequently encountered. These barriers include: the lack of access to scholarly research and findings for city practitioners; the notion that researchers are not addressing topics that practitioners are most interested in; the concern that practitioners might not be able to interpret and apply material they have acquired from research articles; poor comprehension from academics of the policy process and how to present the policy relevance of their work; and ineffective communication by all parties. Despite these barriers, efforts for cooperation persist because of the potential that practitioner-researcher collaboration holds. The divide between what policy makers require and what they can quickly obtain provides both the opportunity and the need for researcher involvement in the public process. Through their activities, researchers can offer valuable reflection (which is difficult for practitioners to find the time for) and outline the possible scenarios which can emerge from a particular set of circumstances. Research thus holds the power to influence the learning process of cities. Findings from ICLEI’s Informed Cities initiative show that both researchers and city practitioners prefer active methods of dissemination (policy briefings, conferences, seminars) to static methods of dissemination (reports, websites). Reflecting this, intermediary bodies and regional networks might be the most effective means of communicating research needs from policy makers to scientists. However, further development of mechanisms for collaboration remains necessary. 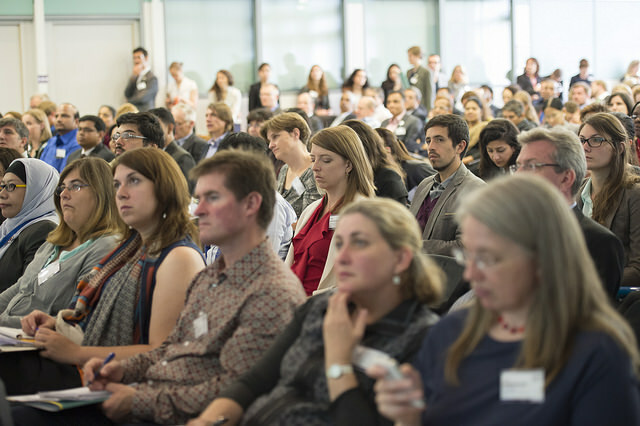 International ICLEI Urban Research Symposium: ICLEI’s Researchers’ Symposium brings together leading urban sustainability researchers to present on topics in international policy making and sustainable development. For the 4th International ICLEI Urban Research Symposium, occurring in Seoul from on 8-12 April 2015, ICLEI has partnered with the Centre for Sustainable Community Development at Simon Fraser University (Burnaby, Canada) and the Seoul Institute to lead a series of researcher-based dialogues (link). Pando: ICLEI is a partner of Pando.sc, an online community with a professional focus. Pando provides an online space for researchers, academics, and public and private-sector practitioners to share knowledge, network, and collaborate on sustainability solutions that can be enacted at the community level. Pando was launched globally in June 2012 at the Urban Research Symposium of the 2012 ICLEI – Local Governments for Sustainability World Congress (link). Informed Cities: The Informed Cities initiative – making research work for local sustainability – is a European initiative driven by ICLEI’s Europe Secretariat. Informed Cities bridges the gap between sustainable development research, policy-making, and practice at the local level. Drawing on various research projects, the Informed Cities initiative is a meeting place for dreamers, thinkers and doers who want to co-create the future of European cities. The Informed Cities Forum: The Forum gathers European local governments and leading European researchers in the field of urban sustainability management, and has been an important first step in bridging the gap between research and policy-making. It offers a platform for a mutual transfer of knowledge, and paves the way for translating the wide range of existing European research tools into practice (link). InContext: ‘InContext’ was a three-year research project, funded by the European Union, that investigated the framework of conditions enabling societal transition towards an ecologically sound, economically successful and culturally diverse future. In this pursuit, action-research was used in order to address real-life sustainability challenges and generate theoretical insights. Reflections on the research process were presented in a paper, “Action Research for Sustainability. Reflections on transition management in practice” (link). ARTS: ARTS(Accelerating and Rescaling Transitions to Sustainability) is committed to understanding the role and impact of transition initiatives in cities and examining the conditions that can aid accelerating change towards a sustainable low-carbon society (link). In addition to the Researchers’ Symposium, the ICLEI World Congress will host a sub-plenary titled ‘The Power of Linking Research to Practice’. This session, being held on 9 April, will convene a panel of prominent researchers, local government leaders, and practitioners to investigate promising solutions for city-researcher collaboration.